Round two of this great butter alternative. Enter a recent serious contender for favorite fat: unrefined red palm oil. This oil is cold-pressed from the fruit of the oil palm tree and has been used for centuries in tropical areas of Asia and Africa where the oil palm tree is prevalent, a bit like olive oil has been used for ages where olives grow. It contains more alpha/beta-carotene (vitamin A) and tocotrienols (an antioxidant vitamin E relative of tocopherols) than any other oil. It’s trans-fat free, not hydrogenated, and does not need processing with any solvents like hexane (common with most vegetable oils). It is not bleached or deodorized. And best of all, it’s high in stearic acid, the saturated fat that is also present in beef tallow, causing it to be fairly solid at room temperature (and great for whipping!). Consuming stearic acid, and other saturated fats, has recently been proven to have no association with elevated LDL (“bad”) cholesterol levels in the blood (as previously thought) and in fact increases levels of HDL (“good”) cholesterol. And in defense of a high fat diet, this study showed that a low carbohydrate diet (which is inherently high in fat, particularly saturated due to meat consumptions, etc) actually lowers various cardiovascular risk factors like overall triglycerides, fasting glucose levels, blood pressure. Therefore, red palm oil has a solid place in a nutritionally sound diet, and more so a dairy-free diet, where saturated fat sources are limited due to no dairy fat consumption (dairy fat is made up in part with the saturated fat palmitoleic acid). Sourcing your red palm oil is a serious matter, since the kernels from the fruit are used to make palm kernel oil, which is a completely different product. Palm kernel oil is used heavily today for a number of unsavory purposes. It’s listed commonly as: vegetable oil, palmitic acid, and sodium lauryl sulfate, to name just a few. That means it’s in your lipstick, shampoo, soap, detergents, margarine, fuel, and many packaged products like bread and chocolate. And like I’ve discussed here and here, those should be avoided at all costs. Palm kernel is in such high demand and therefore often responsible for the wrecking of rainforest and chimp habitats. The high demand generally also means high yield at any cost, like heavy pesticide use. Basically: gross, gross, and gross. Read your labels and make sure you are getting the good stuff. It should be bright, bright orange and semi-solid at room temp. It should say “unrefined” and “cold-processed” and look for organic if possible. There are many companies producing red palm oil from natural environments where oil palm trees have existed for years. I use the Nutiva brand because it’s highly unprocessed and they state clearly that their processes are safe and humane. You could use only red palm oil for a whipped version of this, but the taste is fairly strong for most people. It’s a bit like carrot or maybe even a little watermelon-y? It’s hard to describe but it’s actually very mild and it grows on you, just give it a little time. Using a second oil in combo helps to both make it softer when chilled and mellow out the flavor. In recipe #1, I used extra virgin olive oil for the unsaturated fat–I really like how it pairs with the coconut oil. But here, I thought the strong flavor of a good EVOO just clashed with the red palm and that a mild oil was needed. I chose avocado oil because it’s a fairly thin oil, still cold-processed with great vitamin E and monounsaturated fat levels. The amount of avocado oil added will yield a variety of uses. Less avocado oil gives a thicker, whipped version which will work better for (most) baking needs since it comes closer to the saturated fat levels in butter. Adding more avocado oil provides for a soft, spreadable version for putting onto warm sweet potatoes or (hopefully paleo) baked goods. The spreadable version is soft when refrigerated so it’s much easier to use straight from the fridge. Melt the avocado oil, red palm oil, and sea salt in a small saucepan. Use low heat until the salt is just dissolved. Pour into the bowl of a stand mixer and place the bowl in the refrigerator for 30 minutes to 1 hour, or until the oil has solidified. Remove from the fridge and using the whisk attachment on your stand mixer, whip on high speed about 30 seconds to 1 minute. The mixture should lighten in color and become very creamy. Scoop it into a large glass jar and store in the refrigerator. Melt the avocado oil, red palm oil, and sea salt in a small saucepan. Use low heat until the salt is just dissolved. Pour into the bowl of a stand mixer and place the bowl in the refrigerator for 30 minutes to 1 hour, or until the oil has solidified. 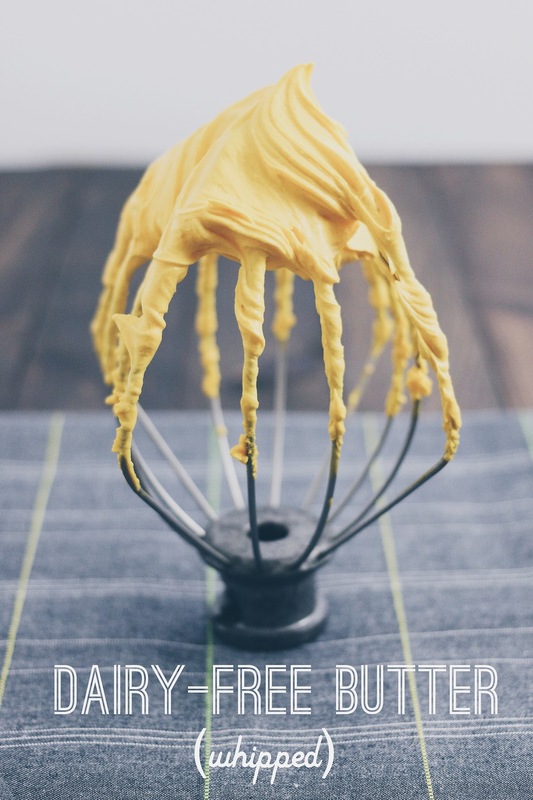 Remove from the fridge and using the whisk attachment on your stand mixer, whip on high speed about 1-2 minutes, until it’s lightened in color and looks fluffy. Portion into a mold (this is the one used above) or plop it straight into a large glass jar. Store in the refrigerator. It will need to be removed about 10 minutes prior to use to soften a bit. Note: whipping for too long can add heat and cause the mix to start melting. If you whip looks a little limp, place the bowl AND whisk into the freezer for 2-3 minutes, then whip again. Love the beautiful color! Can’t wait to try it out! I am so so happy I found your blog and this amazing recipe. You are a life saviour! And I am sure I will find many more great recipes here. I am not vegan, but I recently found out I have intolerance and/or allergies to flour/gluten, potatoes, milk/dairy, preservatives, olive oil, coconut, paprika… and it is quite overwhelming when time for preparing a meal (for home or work) comes. It has been just a week of new regime, and I felt kind of helpless at times but when I find great recipes and recources like yours I can say there is light at the end of a tunnel. Thank you for that. Love that beautiful “grassfed butter” color! It needs to be an oil low in saturated fats (one that doesn’t harden when cold, basically). Other nut oils would likely add a lot of flavor, which may or may not be a bad thing. They’d work though. Another option would be light olive oil, it has very little flavor. Would canola oil work in place of avocado oil (for a slightly less expensive alternative)?